Crowns are used in variety of situations, to cover and support a weak tooth, or one with a very large filling where there is literally more filling left than tooth. Crowns are also used to cover a dental implant or hold a dental bridge in place. When a tooth is compromised, all other teeth around it (including above or below it) are in danger. Crowns can be permanent or temporary. Temporary crowns, which are acrylic or pre-fabricated stainless steel, are used for children or to hold the place of a permanent crown. Permanent crowns are made in a lab, from a mold made in the dentist’s office. They can be stainless steel, all metal (such as gold or another alloy), porcelain-fused-to-metal, all resin, or all ceramic. Metal crowns are the strongest, can withstand years of biting forces and are the least likely to chip or break. The main issue with metal crowns is the color, which makes them the best choice for out-of sight molars. 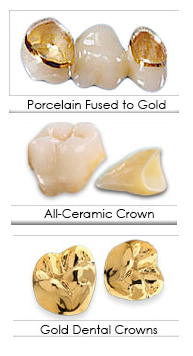 Porcelain-fused-to-metal crowns are very strong and the color matches your teeth, with 16-20 colors to choose from. The metal under the porcelain will show as a dark line at the gums, and can grow if your gums recede. 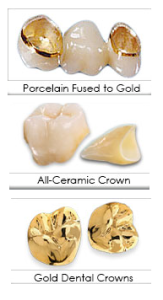 The color of all resin crowns also matches your teeth, and may be less expensive than other crown types. All resin crowns can fracture and wear down over time. 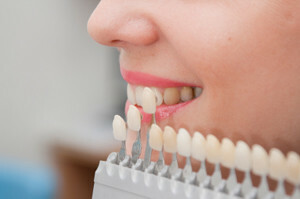 All ceramic crowns allow for the best color match than the other crown types, so they are best for front teeth. They are not as strong as porcelain-fused-to-metal crowns and may wear down opposing teeth more than the other crown types. 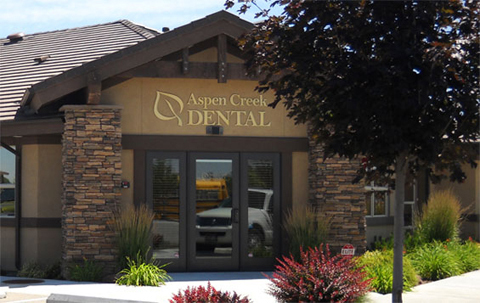 At Aspen Creek Dental, w e place a crown in two visits, the first to prepare the tooth and take a mold for the permanent crown; the second to place the crown. To prepare the tooth, we need an x-ray to check the roots, surrounding teeth and bone. We may need to do a root canal if the tooth roots are infected or injured. If so we will numb the area and do a root canal and file down the remaining tooth to receive a crown. We will discuss all the choices for material for the crown, so you can weigh the benefits off each. We then make a mold for the crown and the opposing teeth, and then put on a temporary crown while our lab builds your permanent one.